Rebuilding in the Everglades | Kid Reporters' Notebook | Scholastic Inc.
Last summer, Hurricane Irma wreaked havoc along the Atlantic coast, striking five countries and several Caribbean Islands. The strongest hurricane recorded in the Atlantic region since 2005, Irma caused more than $66 billion in damage. The storm, which began in August, hit the Eastern United States in September, causing the most damage in Florida. The Everglades National Park in Southern Florida was hit especially hard. The 1.5 million-acre preserve is the largest subtropical wilderness in the U.S. It is home to mangroves, wetlands, and pine flatwoods, as well as such threatened or protected species as the Florida panther, American crocodile, and West Indian manatee. Damage to the Flamingo Visitor Center in the Everglades temporarily forced tourists outside. 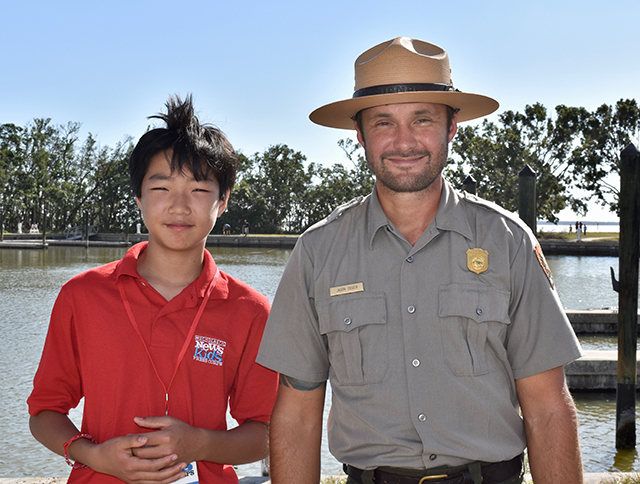 During a recent visit to the Everglades National Park, I spoke with Jason Deger, a ranger at the Flamingo Visitor Center, which was temporarily closed due to damage caused by the hurricane. Still, the Category-5 storm caused extensive damage to several structures, flooding the first floor of the visitor center and ripping off the roof. A crocodile swims near the visitor center in the Everglades National Park. When asked how kids can help preserve our national parks, Deger said that the first step is learning about the park system. Preserving wildlife, Deger added, lies in the hands of today’s young people.